How Is Your Organizational Health? How healthy is your organization? Patrick Lencioni, a speaker at the L2L event on October 9th, defines organizational health as, “An organization that functions effectively by building a cohesive leadership team, establishing real clarity among those leaders, communicating that clarity to everyone within the organization and putting in place just enough structure to reinforce that clarity going forward.” Those four disciplines are vital to your organization’s success, and when one is lacking, it affects the company as a whole. Look at your business as a living and breathing entity, with the leadership team as the brain. If the whole brain isn’t on the same page, it can’t create the decisions needed to control the daily tasks of the other parts of the organization. Similarly, if that decision isn’t communicated or reinforced, the other parts of the organizational body won’t know to follow. A cohesive team builds trust, eliminates politics and increases efficiency by knowing one another’s unique strengths and weaknesses, openly engaging in constructive ideological conflict, holding one another accountable for behaviors and actions, and committing to group decisions. Leadership acting as one strong unit is the core of your organization. Turmoil within the leadership team causes distress on your organization, and Lencioni argues that the damage caused by a dysfunctional leadership team will cascade down through the rest of your organization. In his book, he provides concrete steps a leadership team can take to prevent this. It is critical that members of your leadership team are intellectually aligned around these six questions, which shape your organization’s mission and what is of the utmost priority for the next few months. Be specifying goals and an operational focus within the leadership team, people who are one, two or three levels below them should also be able to have complete clarity about what they need to do to make the organization successful. Repetition: Don’t be afraid to repeat the same message, again and again. Simplicity: The more complicated the message, the more potential for confusion and inconsistency. Multiple mediums: People react to information in many ways; use a variety of mediums. Cascading messages: Leaders communicate key messages to direct reports; the cycle repeats itself until the message is heard by all. Once your leadership is on the same page, it is time to share it with the rest of your organization constantly. Leaders of a healthy organization constantly repeat themselves and reinforce what is true and important. They err on the side of caution by saying it too much, rather than too little. This quality sets leaders of healthy organizations apart from others. Organizations sustain their health by ensuring consistency in hiring, managing performance, rewards and recognition, and employee dismissal. It is not enough to simply communicate the message. Your organization must LIVE the message. Reinforce what you believe through the processes that involve people, from hiring and firing to performance management and decision-making. Keep your goals and values at the core to intentionally support and emphasize the uniqueness of the organization. Healthy organizations recover from setbacks, attract the best people, repel the others and create opportunities that they couldn’t have expected. 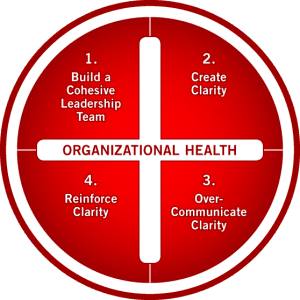 Click here for Lencioni’s Comprehensive Organizational Health Check List. To see his live simulcast in the Des Moines, click here!